Facebook announced in recent weeks that they’re expanding their advertising empire. 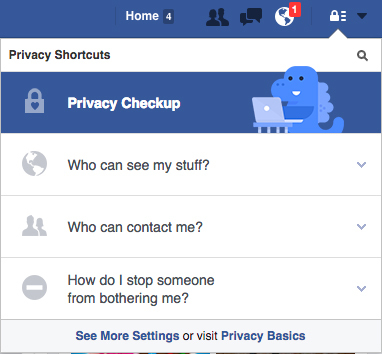 With that change, came a stealthy new privacy setting for users — one that all of us are opted-in to by default. Instead of just selling ads on Facebook, or on Facebook platforms (like WhatsApp and Instagram), Facebook is now selling ads everywhere, to everyone, whether or not you have a Facebook account. If you do have a Facebook account, though — like 1.6 billion other humans do — Facebook will also use your Facebook data to sell those ads. Here’s where the privacy settings come in: Facebook has long had opt-outs for collecting and using your behavioral data in advertising to you. But they added or re-worded one when they broadened their advertising business this week, and every member of Facebook is set to participate in this new one unless you specifically go and opt out. That’s for web Facebook. If you’re on the Android app, go to the three-bar “hamburger” menu icon on the right and then scroll all the way down until you see “Account Settings” near the bottom. If you’re on the iOS app, choose “More” on the bottom right and then scroll until you see “Account Settings” there. You cannot, however, opt out of being advertised to, nor out of having your data collected and aggregated. 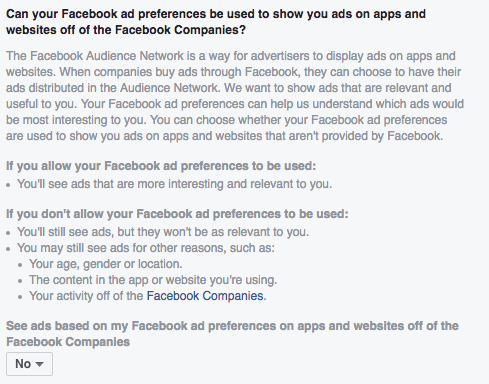 This setting just treats you as a non-FB user for the purpose of having advertising selected for you on non-FB sites.